Cult favorite skincare wrapped up in blue, nested in the snowflakes with sprinkles of gold; this is holiday gifting curated by Fresh. We know them for lipbalms that nourish and face creams that soothe but getting a little bit of everthing is what we really, really want. The Skincare Treasures* set is one of the limited edition blue parcels put together by Fresh and features four of their best selling products in deluxe mini sizes coupled with major savings. It's a ready to go full basic routine in a box that's fit for all ages with gentle, moisturizing products. I had a chance to try everything leading up to December so here's the quick breakdown. SOY FACE WASH | A non-irritating and non-drying cleanser that's lightweight yet soothing, this face wash is great as a morning cleanser to soften and refresh. It has a silk texture similar to Cetaphil and is faintly foaming but don't let its mild nature fool you, this leaves my skin relaxed and calm. Not recommended as a makeup remover but a great choice for sensitive skin. SUGAR FACE POLISH | This little scrub is a sweet surprise in a jar; made with brown sugar and strawberry seeds you can use it on damp skin directly or mix it with a few drops of water before applying. The sugar granules melts away as you work and this rinses clean with no residue so no chances of over exfoliating here - those of you who rub your skin raw, you know who you are. I personally like something a little finer but this has been touted as a cult favourite so I had to try it a least once! LOTUS YOUTH PRESERVE CREAM | Lightweight, super smooth and filled with radiance boosting ingredients like blue green algae, lotus flower and vitamin C, this would be a great fit for sensitive skin, oily skin or those in warmer climates. 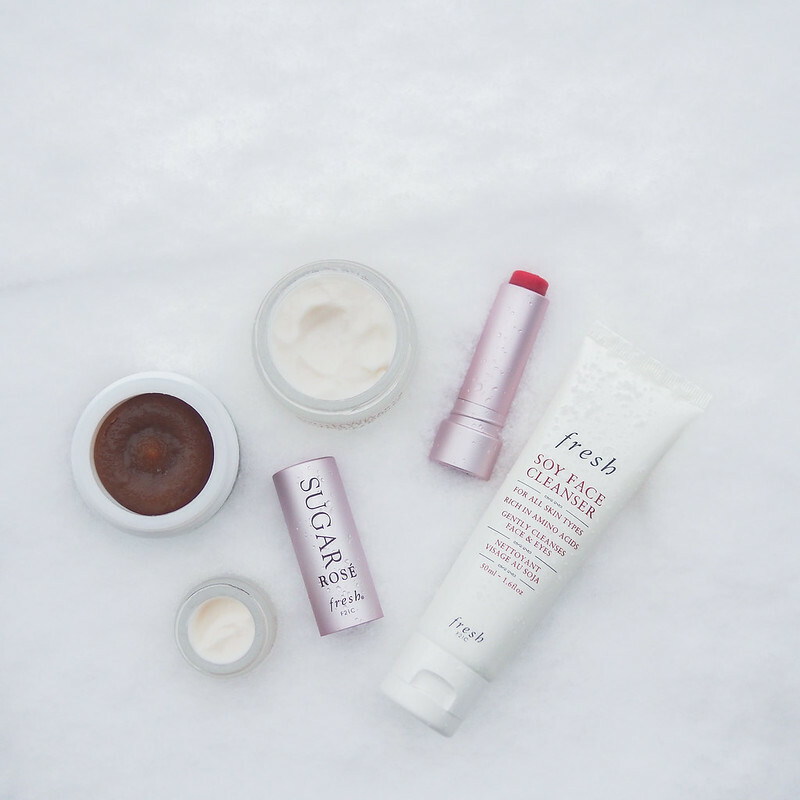 I enjoyed using it as a morning base under makeup since it spreads well and makes my skin silky to the touch but in this Canadian winter, I needed something heavier to combat the dehydration so I would recommend the Creme Ancienne if you need to step up. However I'm definitely bringing this back out come spring and summer. LOTUS YOUTH PRESERVE EYE CREAM | Surprisingly my favourite item in this set, this eye cream has a similar texture to the face cream and is a nice pick for those who want something refreshing, lightly moisturizing and a touch of depuffing action. It absorbs quickly too so you can get on with your morning makeup and you can put it all over your eye contour without worrying about smudgey eyeshadow. I see it as an introduction to eye cream and for those who don't want to be weighed down. SUGAR LIP BALM | Not a classic for nothing and probably one of Fresh's most well loved products, this luxury balm in a metal twist off cap really does work. It's not goopey, thick or laddened with mineral oil yet it feels so comfortable on the lips and it's been my most used night time balm the last few weeks. Granted the scent still hasn't grown on me yet but that's the only downside to this product. Oh yes, this is also my going outside to shovel the snow lipbalm. FIND IT | Fresh online, Fresh in-store and select Sephora locations. Final thoughts on this set? It's that easy, impressive box that's fit for both the beauty lover and the beauty beginner alike as it's easy to use, non-fussy, luxurious yet gentle. It's for those times you want to share a skincare gift but aren't sure what would suit them best. With a neutral spa-like packaging and inoffensive scent, this would make an excellent unisex box to get the men in your life to start upgrading from that soap on a rope. Hey, get a jump start on that new years resolution right?